It must be that time of year. 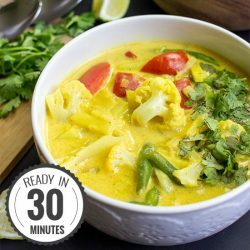 I’m craving curry and I’m craving a health-kick, and I want them now. 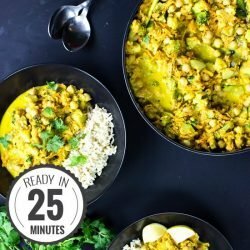 Roasted cauliflower curry takes care of both. Remember when I said how much I love Indian cuisine? That’s true. Very true. It’s amazing food, and one of favourites. But it’s only half the truth. I also love Pakistani cuisine. Not so different from Indian foods in many ways, it does in fact share a huge amount of similarities with it. This isn’t particularly surprising as the two countries have a much entwined history – they were together until 1947. The sheer scope and size of the Indian and Pakistani cuisines makes it hard to pin down exactly what characterises them. 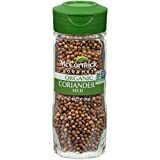 As they vary wildly from region to region, there is no such thing as a truly defined example, just a beautiful hot pot of cooking skills and knowledge that often include many varieties of curry mixes, oils and spices. This particular recipe comes from Rabia in Pakistan, and it’s an absolute stellar example of Pakistani-based cooking. 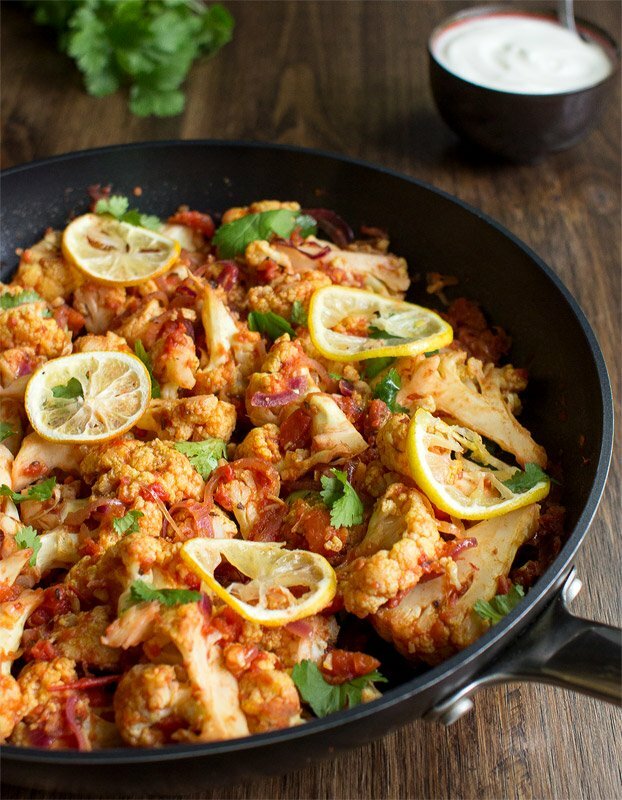 The ingredients are pretty straight-forward: it’s a curry dish using roasted cauliflower on a tomato base, but the way it’s cooked has a huge impact on fusing all those lovely ingredients into something great. Let me say right away this roasted cauliflower curry needs attention to make it really tasty. But then it’ll be REALLY tasty! The roasting part is crucial here. ‘Why roast the bloody cauliflower anyway?’ you might ask. ‘Why not just steam it instead?’. Well, if you steam or blanch cauliflower it’ll often go soft and mushy, but by roasting it, you bring out its sweetness. And caramelized veggies are awesome, and an integral part of this dish. But here’s the kicker: if you roast veggies for too long they won’t taste sweet and crunchy anymore, they’ll be burned and crunchy instead. Rabia would like to point out that cauliflower is ridiculously nutritious, a wonderfully healthy vegetable. It has been found to help out with decreasing the risk of so many serious ailments including cancer, heart disease, diabetes and obesity. It’s something that WHFoods recommend eating on a very regular basis to keep your heart and body in tip-top condition. She also notes that cauliflower can cause gastric problems for an unlucky few – but thankfully there is a way around this. Adding celery seeds to cauliflower (or to other dishes for that matter) can massively help with bloating of the stomach, as well as keeping exhaustion, headaches and nervousness at bay. 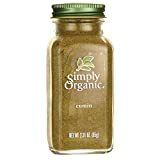 Pregnant women should stay away from celery seeds however, and as hurrythefoodup.com is not a medical care or advice giver in any way you should always check with a relevant qualified professional (i.e your doctor) when changing any aspects of your diet. 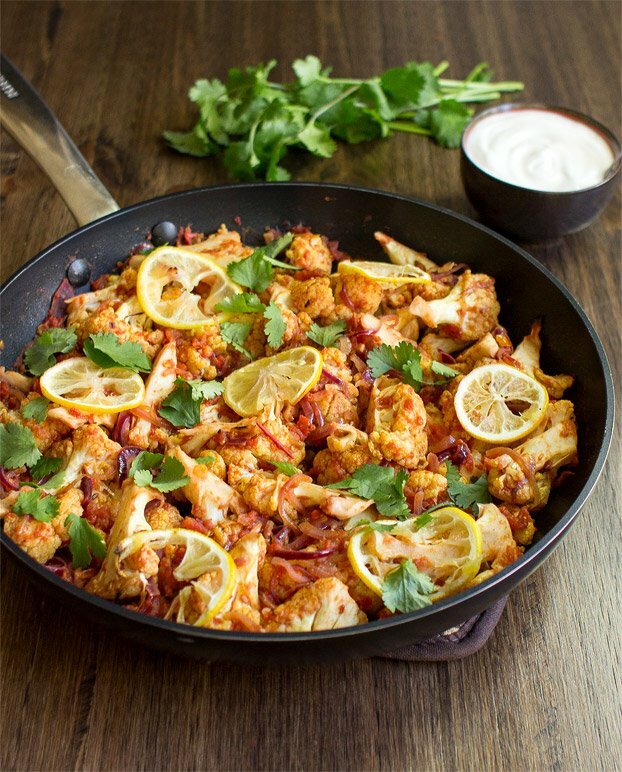 An exciting fusion of Pakistani spices combine with crunchy roasted cauliflower in this classically cooked dish. Preheat oven at 350°F (180°C). 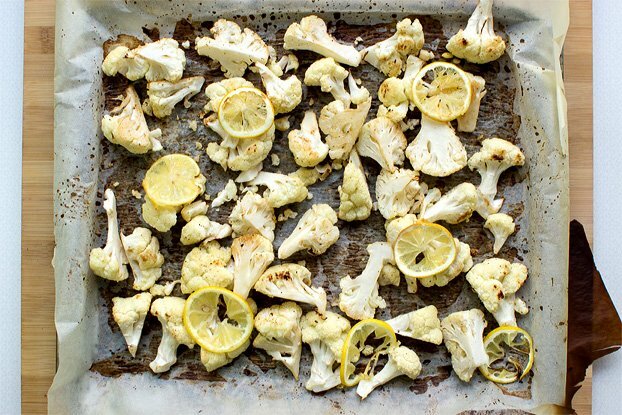 Toss the cauliflower florets with salt, black pepper, lemon juice and half of olive oil. Place the florets on a baking tray and of it goes into the oven. After 10 minutes take out the sheet and turn over the florets so they won’t burn (Important!). Then roast for another 10 minutes. In the meanwhile, heat oil in a saucepan and add onion. Saute for 2 to 3 minutes until translucent. 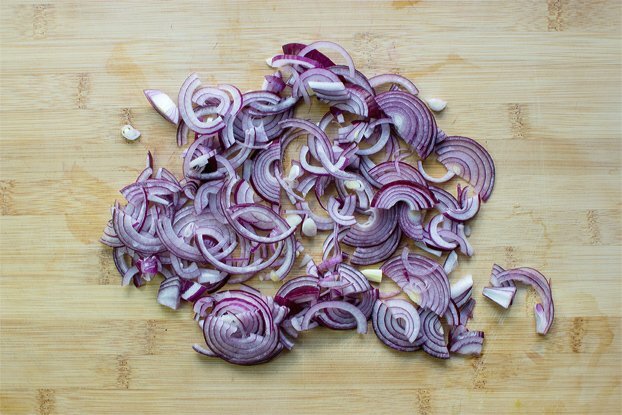 Add finely chopped garlic, cumin, coriander seeds and red pepper flakes to the onion along with the curry powder and again saute for 30 seconds until aromatic. 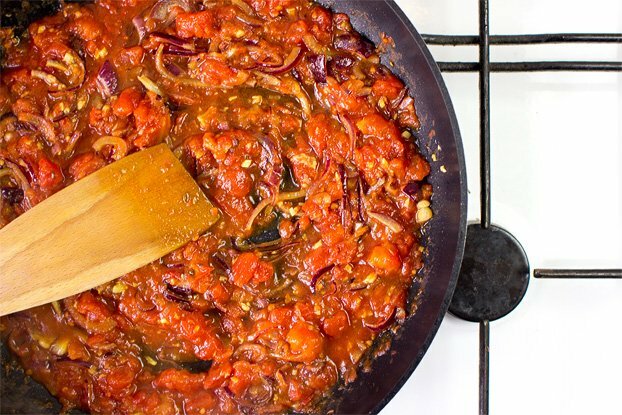 Finally add tomato purée (or tinned or fresh tomatoes), season with salt, cover the lid and simmer for about 5 to 6 minutes. If using fresh tomatoes then mash with a wooden spatula when tender. Take out the roasted cauliflower from the oven and add it to the sauce mixture in the pan. You might want to a couple of dashes of water as well. Cook on low heat for about 10 minutes then finally add some, peeled and grated ginger and fresh coriander. Serve with (soy) yogurt and enjoy hot. To feel satisfied you’ll probably want a few carbs on the side. White rice or garlic or naan bread goes really well for that purpose! IF YOU LIKED THIS RECIPE: Then you definitely need to check out our Vegan Chickpea Curry. We’re 100% sure you’ll get addicted to that one. This Lemon and Pea Pulao should NOT be missed either. Yerrr, this one is pretty good I must say. Sooo much better on the second day too! I’m not a vegan, or a vegetarian for that matter, but this dish looks delicious. I should really give something like this a go. Hi there! I just wanted to say that I tried your recipe and it was super delicious. The curry gave it a special touch that I loved. I’m definitely preparing it again soon. Thank you!! Great recipe. 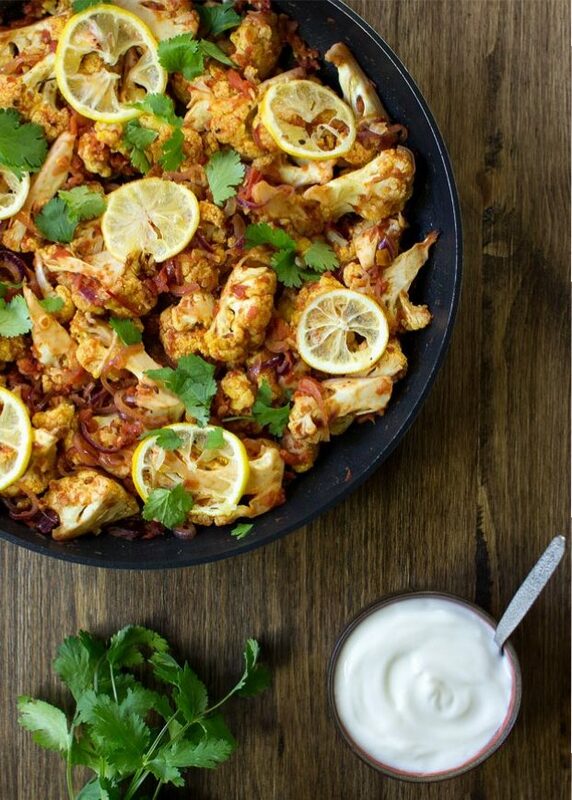 We make roasted cauliflower with curry powder all the time—but this takes it to a new level. 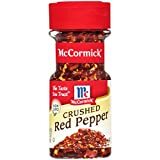 I just linked the recipe to our spice shop. Love it. The recipe is fabulous! My daughter who is Vegan, came for tea and gave me the best compliment . “Did you get this from the Bay leaf?” This is a very good local Indian restaurant. I really enjoyed making the dish and will definitely make it again. The Cauliflower was very sweet, I shall try baking it in future for other recipes. This is wonderful as a curry. I like the depth and richness the tomatoes give, but the real star here is roasted cauliflower. The cauliflower turned out so tasty I couldn’t stop eating right off the pan! 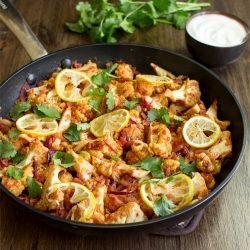 I stumbled on the recipe while looking for a unique rstd cauliflower dish. Wow! The dish is really good and perfectly spiced. Looking forward to the left overs. Thanks! Wow, that recipe was quite delicious! 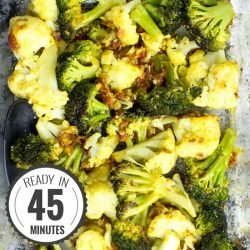 I loved how the cauliflower was full of flavor and had wonderful and balanced flavors! Delicious! Looking forward to make it again. Thanks Maz!! Glad you enjoyed. You rock, too! I’m making this for six but only have two heads of cauliflower. Will it be ok? 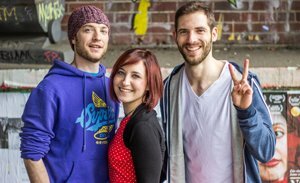 Do you have a sign-up mailing list? If so please include me. I just discovered your site and your recipes are what I’ve been looking for. Hi Barbara! Really glad you like the recipes 🙂 If you go here and sign up for this meal plan: https://hurrythefoodup.com/high-protein-vegetarian-meal-plan/ (it’s completely free!) I’ll then happily add you to our mailing list via email address :). Thank you! Much tastier than the simple ingredients implied. 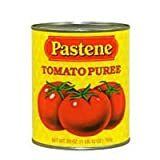 Nearly used tomato purée, then realised the recipe meant puréed tomatoes, ie passata, not the thick tomato paste. Phew. Next time I will add sliced lemons as in the illustrations to boost up the flavour. Ate with quinoa to add protein. Haha yes, passata indeed! 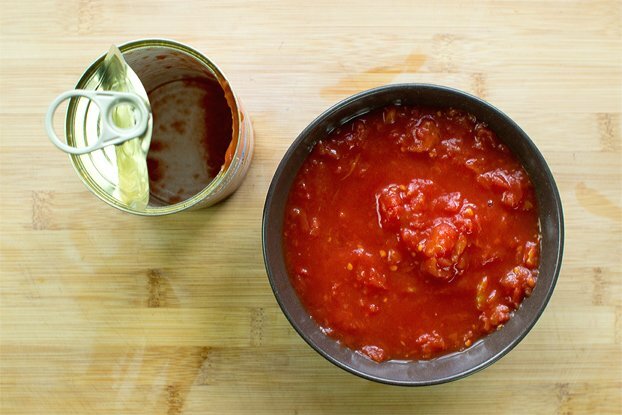 We’ve discussed the names a few times as they’re all called something else in different places :D. I’ll also update the recipe to show ‘passata’. Thanks Ani! !